Sikorsky was born on May 25, 1889, to a prominent family in Kiev, Russia. He was greatly influenced by his mother’s interest in the work of fifteenth­century Italian artist and inventor Leonardo da Vinci. Fascinated by da Vinci’s drawings of helicopter ­like flying machines, at age 12 Sikorsky built a model helicopter powered by rubber bands. In 1903 Sikorsky entered the Imperial Naval College at St. Petersburg but resigned three years later to study aeronautical engineering at Kiev’s Polytechnic Institute. Inspired by news of the Wright brothers’ first airplane flights, Sikorsky accepted his sister Olga’s offer of money to buy a motor and start construction of his own flying machine. Sikorsky devised two helicopter prototypes, in 1909 and 1910, both of which failed to fly; they required more powerful engines. He turned to the development of conventional aircraft instead. Several successful designs earned him a commission to construct a bomber for the Russian Imperial Army. In 1913 Sikorsky unveiled the Ilya Mourometz (known also as Le Grand), a huge plane with four engines and the ability to carry heavy bomb loads. This first multi­ motored airplane was used during World War I. In 1919 Sikorsky fled to New York City to escape the political unrest following the Russian Revolution. Subsisting for several years as a schoolteacher, he acquired financial support to start an aeronautical engineering company in 1923. In 1925 he completed the S­29, an all­ metal passenger­ carrying monoplane, followed by the versatile S­38 seaplane. In 1929 his successful company was purchased by the United Aircraft Corporation. The S­40 (the American Clipper), an advanced version of the S­38, appeared in the 1930s and became the standard craft for international flights. In the late 1930s, Sikorsky convinced United Aircraft to invest in the development of a helicopter. In 1939 Sikorsky piloted the first flight of a practical single­ rotor helicopter, the VS­300. The vehicle had an open­ air cockpit and was powered by a 75 ­horsepower engine turning a three ­bladed rotor. It could rise, float, and move in any direction. 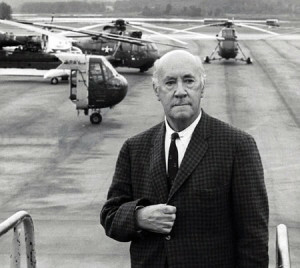 Sikorsky continued to refine his designs until 1957, when he retired from active involvement in research and development. He died at Easton, Connecticut, on October 26, 1972. Sikorsky introduced many of the principles of aircraft design that remain staples of modern aeronautical engineering. He is best­ known for his invention of the helicopter, a unique vehicle with a wide range of uses, and his numerous contributions to the evolution of airplanes have had a great impact on modern living and international trade. Sikorsky’s seaplanes introduced intercontinental flight as a new transportation option. The S­38s were used primarily between North and South America, creating an efficient means of transporting passengers and trade goods between the continents. The S­40 opened trans­oceanic air travel to the general public (although for several decades the high cost restricted flight to the upper economic class). Sikorsky’s helicopters proved valuable for practical and emergency purposes in the 1940s. They carried mail and transported passengers from airports to city centers. In January 1944, helicopters carried blood plasma from New York to the New Jersey site of a steamship explosion, saving the lives of hundreds of victims. Helicopters were first purchased by the United States Army in 1941, but they were rarely used until the 1950s, when they became a standard military vehicle. In both the Korean and Vietnam Wars, they were used to pick up and deliver forces and supplies in remote areas without airstrips. By the 1960s helicopters were used to observe traffic, fight fires, spray crops, and lift heavy loads to the tops of buildings. They have become invaluable for rescue operations at sea and in mountainous regions, and are used to supply aid to disaster areas.